Arbutus is an unincorporated community and a census-designated place in Baltimore County, Maryland, United States. The population was 20,483 at the 2010 census. 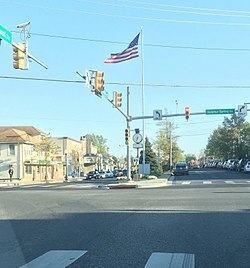 The census area also contains the communities of Halethorpe and Relay, in which all three names were used during the 1960 census when the area had a population of 22,402. Residents of Arbutus are often called Arbutians or Arbutusians. "Life is heaven in 21227!" Arbutus is located at 39°14′40″N 76°41′38″W﻿ / ﻿39.24444°N 76.69389°W﻿ / 39.24444; -76.69389 (39.244406, −76.693928). According to the United States Census Bureau, the CDP has a total area of 6.5 square miles (17 km2), all of it land. Herbert Run, a stream, runs through Arbutus and surrounding areas. As of the 2010 census Arbutus had a population of 20,483. The racial and ethnic composition of the population was 76.6% non-Hispanic white, 9.5% non-Hispanic black, 0.2% Native American, 2.1% Asian Indian, 6.5% other Asian, 0.1% Pacific Islander, 0.2% non-Hispanic from some other race, 2.3% from two or more races and 2.9% Hispanic or Latino of any race. As of the census of 2000, there were 20,116 people, 8,120 households, and 5,204 families residing in the CDP. The population density was 3,093.8 people per square mile (1,194.9/km²). There were 8,380 housing units at an average density of 1,288.8 per square mile (497.8/km²). The racial makeup of the CDP was 85.21% White, 6.27% African American, 0.28% Native American, 6.10% Asian, 0.02% Pacific Islander, 0.48% from other races, and 1.63% from two or more races. Hispanic or Latino of any race were 1.53% of the population. There were 8,120 households out of which 28.0% had children under the age of 18 living with them, 48.6% were married couples living together, 11.0% had a female householder with no husband present, and 35.9% were non-families. 27.6% of all households were made up of individuals and 9.6% had someone living alone who was 65 years of age or older. The average household size was 2.44 and the average family size was 2.99. In the CDP, the population was spread out with 22.2% under the age of 18, 8.5% from 18 to 24, 33.5% from 25 to 44, 21.3% from 45 to 64, and 14.4% who were 65 years of age or older. The median age was 37 years. For every 100 females, there were 93.8 males. For every 100 females age 18 and over, there were 91.2 males. The median income for a household in the CDP was $47,792, and the median income for a family was $54,003. Males had a median income of $37,766 versus $29,129 for females. The per capita income for the CDP was $22,456. About 4.5% of families and 6.8% of the population were below the poverty line, including 6.5% of those under age 18 and 6.1% of those age 65 or over. Fire and emergency medical services are provided by the Arbutus Volunteer Fire Department Baltimore County Station 35. This station provides fire protection, heavy rescue, swift water rescue, and paramedic-level emergency medical services to the citizens of Arbutus and the surrounding communities. Mutual aid is provided by the surrounding Baltimore County stations as well as the Baltimore City and Howard County fire departments. Police protection is provided mainly by the Baltimore County Police Department, Wilkens Precinct. Additional police service is provided by the Baltimore County Sheriff's Office, UMBC Police, Maryland State Police, and the Maryland Transportation Authority Police. 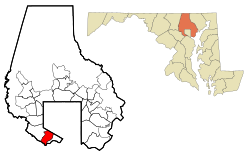 University of Maryland, Baltimore County (UMBC) is located adjacent to Arbutus and the neighboring unincorporated municipality of Catonsville. Primary and secondary schools are operated by Baltimore County Public Schools. Thomas Viaduct, a railroad bridge over the Patapsco River that was listed on the National Register of Historic Places in 1966. Adrienne A. Jones. State Delegate and first African American Female Speaker Pro Tem. Mitt Romney made his only stop in Maryland during the 2012 United States presidential election campaign at the American Legion Post 109 in Arbutus. ^ "Wayback Machine" (PDF). 18 May 2014. ^ "Profile of General Population and Housing Characteristics: 2010 Demographic Profile Data (DP-1): Arbutus CDP, Maryland". U.S. Census Bureau, American Factfinder. Archived from the original on September 11, 2013. Retrieved February 21, 2012. ^ "Table 3: Population of all incorporated places and unincorporated places of 1,000 or more: 1960 and 1950". Maryland Manual 1965-66. Maryland State Archives. p. 746. ^ "CENSUS OF POPULATION AND HOUSING (1790-2000)". U.S. Census Bureau. Archived from the original on July 8, 2010. Retrieved 2010-07-30. ^ Census area returned as Arbutus-Halethorpe-Relay in 1960. ^ "Arbutus Volunteers". Arbutus Volunteer Fire Department. ^ Revelle, J. E. (30 April 1925). "The Thomas Viaduct at Relay, Maryland" – via Internet Archive. ^ "Residents welcome Mitt Romney in Arbutus" Baltimore Sun.